This is one of those questions I had to think long and hard about. Most of the books I read nowadays I pick up and read because of the number of good reviews and the advertising for the book. However, after looking at my bookshelf the decision was painstakingly easy. I’ve mentioned this series and this author numerous times in my blog, but it seems like many people just skip over this series, which in my honest opinion is a humongous mistake! Christopher Paolini, or as I like to affectionately call him, a writing God, created Eragon (book one of the Inheritance series) when he was only 15 years old. Paolini literally grows up before the reader as his character grows up. His writing becomes more elegant, breathtaking, and the story is unbelievably genius. 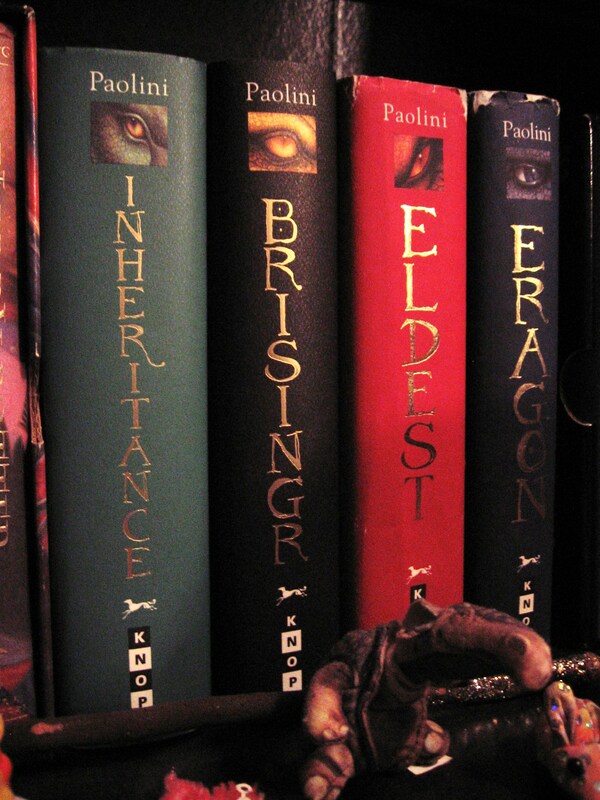 I could praise Paolini all day and night if I had to. The Inheritance Series is my second favorite series after Harry Potter, and it is a CLOSE second. It might have taken first place if Harry Potter hadn’t been a part of my life since 3rd grade. So let’s talk more about the books. These books are quite literally, the most testosterone filled books I have on my bookshelf. I feel like one of the guys when I’m reading it, mainly because the only people I can talk to about this book are my guy friends. Don’t be shy girls, this book is for you too! I won’t give away any spoilers, or at least I’ll try my darnedest not to, but the story begins with a boy named Eragon. He lives in a small town with his Uncle and Cousin and finds a mysterious stone in a forest everyone else is too afraid to enter. That’s about as much of the plot as I’m going to give away. Are you still not convinced that this book is for you? Do you like dragons, witches, Kings, Queens, family secrets, elves, dwarves, horses, battles, hammers, swords, blacksmiths, forgers, rebels, strong characters of both genders, gory details, forbidden love, page turning action, heartbreak, anguish, despair, hope when all seems lost…oh and did I mention dragons? Yeah, tell me again why you don’t want to read this series? Eragon, admittedly, starts out a little slow. DO NOT LET THIS DETER YOU…KEEP GOING…FORGE AHEAD! The secrets revealed in Eldest will leave you begging for more and then, just when you thought you knew everything, Brisingr becomes a total game changer. So you go into Inheritance feeling a little uneasy, gripping the pages so hard, praying that your favorite character will make it to the end, and then it’s finally over and you can breathe again. I do not like roller coasters, but these books were the best ride of my life! Oh my gosh, I sound like such a nerd. Haha! If I haven’t convinced you to at least look into these books…well I just don’t think we can be friends. 😉 Just kidding! Christopher Paolini is the author to watch out for. When reading Eragon, I really didn’t know he had it in him to write the rest of the series the way he did. It was a pure masterpiece and books I will treasure forever. ← Why Did You Have To End So Soon? Interesting! I really haven’t heard a lot about these books. Good choice! Thanks! After writing this I looked into others reviews of Paolini and all I came across were negative reviews (Goodreads had a little more positive feedback though). He’s a new author who is growing and honing his talents and I think it’s unfair that people hold that against him instead of respecting him and admiring him as he develops into a promising writer.